When Alice told me that she would read James Joyce's Ulysses for her class in Modernism during the coming semester, I decided to prepare for her late-night telephone queries by reading it ahead of her. Fabulous artificer, the hawklike man. You flew. Whereto? Newhaven-Dieppe, steerage passenger. Paris and back. Lapwing. Icarus. Pater, ait. Sebedabbled, fallen, weltering. Lapwing you are. Lapwing, be. It sounded like free association to me. The hawklike artificer would be the Daedalus. I had no idea about 'Newhaven-Dieppe, steerage passenger', but later discovered that it refers to a trip Stephen took to Paris and back. 'Lapwing.' No idea. Icarus, Daedalus' son, might be Stephen. 'Pater, ait': 'Father he cried.' Presumably Icarus as he fell. Maybe a classical allusion. (Ovid?) 'Seabedabbled, fallen, weltering' probably refers to Icarus' fall. 'Lapwing you are. Lapwing be,' Without knowing what 'lapwing' meant, I couldn't make it out. I have long since given up looking up every word in Ulysses I don't understand, but when 'lapwing' was mentioned again in subsequent paragraphs, I headed for the dictionary. Our Merriam-Webster College Dictionary defines 'lapwing' as a plover. Not much help. Back to Ulysses. Lapwing. What are the chances of running across the word twice in the same day? Next morning, Hamlet in hand, I looked back at Ulysses to see if Horatio's remark might shed some light on Joyce's meaning. The link with Hamlet seemed obvious enough. Stephen was expounding on Hamlet when the thought occurred to him. Perhaps "the shell on his head" means 'just out of the nest'— the young Stephen lecturing to his elders. The top hit on a Google search of lapwing Ulysses was a 1969 essay by George L. Geckle in the James Joyce Quarterly titled "Stephen Dedalus as Lapwing: A Symbolic Center of Ulysses." Since I could see only the first page on line, I paid a visit to the Melville Library at Stony Brook University and dug out the article. It was heartening to learn that even in 1969, as the war in Vietnam was raging, protesters were marching and hippies were gathering at Woodstock, Dr. Geckle could find time to research Joyce's use of 'lapwing' so thoroughly. Geckle acknowledges the line from Hamlet, but puts his money on the entry for LAPWING in An Etymological Dictionary of the English Language by Walter W. Skeat published in 1882. I found the old book and the entry. LAPWING, the name of a bird. (E.) M.E. lappewinke (four syllables), Gower, C. A. ii. 239; later lapwinke, Prompt. Parv. p. 288; spelt lhapwynche, Ayenbite of Inwyt, p. 61, l. 31.—A.S. hleápewince, Wright's Vocab., i. 62, col. 1, l. 22. β. The first part is hleápe-, connected with hleápan, to run, spring, leap; see Leap. γ. The second part of the word is, literally, 'winker;' but we must assign to the verb wink its original sense. This orig. sense appears in the O.H.G. winchan, M.H.G. winken, to move from side to side, a sense preserved in mod. G. wanken, to totter, stagger, vacillate, reel, waver, &c. Thus the sense is 'one who turns about in running or flight,' which is (I believe) fairly descriptive of the habit of the male bird. The G. wanken is from the same root as Lat. uagus, wandering; see Vagrant and Wink. ¶ Popular etymology explains the word as 'wing-flapper;' but lap does not really take the sense of flap; it means, rather, to droop, hang down loosely; see Lap (2). This interpretation is wrong as to both parts of the A.S. form of the word, and is too general. The crucial piece of evidence that this was Joyce's source for the word—the metaphorical smoking gun—is the reference to Ayenbite of Inwyt, which bubbles up as 'Agenbite of Inwit' in Stephen's mind throughout the day. and zuo resteth. thet byeth the ssarnboddes thet beuleth the floures. If Geckle is correct, Stephen's reverie is a bit of self-loathing ; he is imagining himself as an abased Icarus wallowing in the dung. It fits, but what does it mean? Geckle concludes that Joyce's portrait of Stephen in Ulysses is radically different from his treatment of Stephen in Portrait. In the Ulysses, Stephen is no longer the soaring young artist, but a disillusioned failure, "mourning under the incubus of remorse." Another interpretation, pooh-poohed by Geckle, links lapwing with a perdix that emerged from the site of Icarus' fall in Ovid's Metamorphoses. In Ovid's tale, a perdix poked its head from a muddy ditch as Daedalus buried his fallen son. 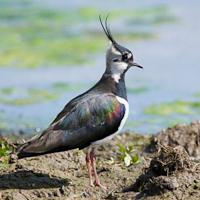 In some translations, 'perdix' is rendered as 'lapwing.' If this is the reference, Stephen does not wallow in the mire of remorse, but reemerges from his fall a chastened, but still cackling bird. This too fits—except Joyce probably would translate perdix as partridge, not lapwing. I'm going to venture a third way, taking a clue from a passage in Joyce's Stephen Hero, a work that preceded A Portrait of the Artist as a Young Man. Geckle points to a passage in which Joyce pictures Stephen reading Skeat's Etymology by the hour. "People seemed to him strangely ignorant of the value of the words they used so glibly," Joyce writes. "And pace by pace as this indignity of life forced itself upon him he became enamoured of an idealizing, a more veritably human tradition. The phenomenon seemed to him a grave one and he began to see that people had leagued themselves together in a conspiracy of ignobility and that Destiny had scornfully reduced her prices for them. He desired no such reduction for himself and preferred to serve her on the ancient terms." The Stephen of Ulysses still refuses to join the conspiracy of ignobility. He still desires no such reduction of himself, but he has flown too close to the sun and lost his wings. He is a fallen, weltering lapwing who wallows in dung, but he continues to serve Destiny on the ancient terms. He remains a fabulous artificer, a hawklike man. He flew, but fell. I can only hope that when Alice calls she asks about lapwing. I will be ready.